Join Interabang Books as ANNA QUINDLEN introduces NANAVILLE: Adventures In Grandparenting. We are thrilled to welcome her to Dallas the week her book is published! 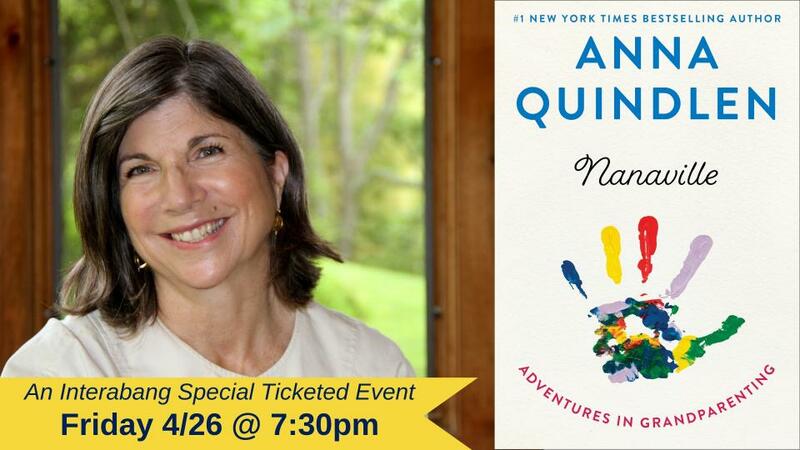 PLEASE NOTE: Originally announced to take place at Highland Park United Methodist Church on the same date at 7 PM, Anna Quindlen's ticketed appearance will now be at Interabang Books at 7:30 PM. Any ticket holders unable to adjust to this change in venue, for which we apologize, may request refunds. We thank our supporters for their understanding and accommodation of this change. This is a ticketed event. Each ticket includes a copy of NANAVILLE. Anna Quindlen will sign books for those who attend after her conversation with Rena Pederson. Advance purchase is encouraged, and tickets can be purchased here. A novelist and journalist whose work has appeared on fiction, nonfiction, and self-help bestseller lists, Anna Quindlen has produced another winner in her new work of nonfiction, NANAVILLE. She reflects on the different maternal roles we play throughout our lives and explores the joys and revelations of being a first-time grandmother ... no longer mother and decision-maker, but secondary character and support to her son and especially to her daughter-in-law, who is beginning her own motherhood journey. Packed with her signature wisdom, humor and wit, this is Anna at her best on family, female relationships and being a parent/sister/friend/mother-in-law. Across the country, grandparents are taking more active roles in their grandchildren’s lives. 2.6 million adults are raising their grandchildren, and since the 1970s the number of children living with grandparents has doubled. As timely as ever, and again showing an uncanny ability to capture the pulse of life’s most memorable moments, Anna Quindlen speaks to women of all ages who are embracing a new way of grandparenting in NANAVILLE. ABOUT ANNA QUINDLEN: While a columnist at The New York Times, Quindlen won the Pulitzer Prize and published two collections, Living Out Loud and Thinking Out Loud. Her book A Short Guide to a Happy Life has sold more than a million copies. She is the author of nine novels: Object Lessons, One True Thing, Black and Blue, Blessings, Rise and Shine, Every Last One, Still Life with Bread Crumbs, Miller’s Valley, and Alternate Side. Her memoir Lots of Candles, Plenty of Cake, published in 2012, was a #1 New York Times bestseller. Her Newsweek columns were collected in Loud and Clear.